(click on photos) 4041-1/2 Los Feliz Boulevard @ Tica Drive. 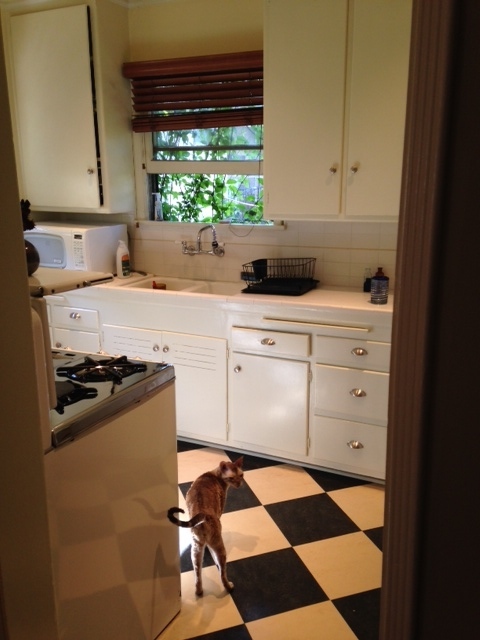 The historic French Quarter at the Hampton Court Compound in Los Feliz, upper-back one bedroom. Hardwood floors, high ceilings, deco and great architectural details, great lighting, vintage stove, dining, office space, bathroom renovated and has separate shower, tub and pedestal sink. A/C in bedroom, light and bright. In-home work space. Parking for one car off-street. Common area roof deck with city view. Laundry on premises. Great location, just east of Hillhurst Village, shops, eateries, market. Minutes to Greek Theater, Griffith Park, Observatory, Burbank, Glendale, Pasadena, Silverlake, Downtown, 5 Freeway, Hollywood and most of the major Film Studios. Note: sizes and availability are estimated. 2 pet max, indoor cats are usually OK, dogs are only on a case by case basis and must be an approved breed (no mystery mix), 40#'s max at maturity, apartment trained, additional deposit. Available sometime in March or no later than April 1st @ $2,595.